— Sen. Scott Wagner (R-York) announcing his departure from the Senate to focus on his gubernatorial campaign. Senate Bill 22 proposes to amend the state Constitution regarding reapportioning and redistricting in Pennsylvania. House Bill 149 adds a section to the Crimes Code covering the unlawful use of an audio or video device in court. House Bill 236 improves the collection of restitution for crime victims by authorizing courts to order wage attachment for defendants for the payment of restitution, fines and costs. House Bill 285 requires minimum deductions from the wages and personal accounts of inmates who have outstanding restitution or other court-ordered obligations. House Bill 824 requires the Department of Military and Veterans Affairs to establish in Pennsylvania the National Guard Youth Challenge Program, a dropout recovery program that helps at-risk young people earn a high school diploma or equivalent. House Bill 983 makes an abusive spouse ineligible to receive alimony pendente lite (APL) from the person that he or she was convicted of abusing. House Bill 1644 creates a uniform standard of practice for collaborative law, a voluntary alternative dispute resolution process. House Bill 1918 upgrades Pennsylvania law to help prevent and punish the use of credit card skimming devices. On Wednesday, the Senate approved legislation sponsored by Sen. Pat Browne (R-Lehigh) that will create a new threat monitoring system to help reduce school violence. The Senate approved legislation Wednesday sponsored by Sen. Ryan Aument (R-Lancaster) to reduce fraud in the Supplemental Nutrition Assistance Program (SNAP) and hold perpetrators accountable. The Senate approved legislation Tuesday sponsored by Sen. Wayne Langerholc (R-Cambria) to help courts provide better treatment options to defendants addicted to opioids. On Wednesday, the Senate approved legislation sponsored by Sen. Don White (R-Indiana) that will require insurance companies and Medicaid to reimburse emergency medical services agencies for services provided even when transport to a hospital does not take place but care is rendered. The Senate passed a package of bills last week that will provide savings for many Pennsylvania municipalities and save taxpayer money. Advocates and fellow legislators joined Sen. Stewart Greenleaf (R-Montgomery) for a rally Tuesday calling for the passage of Senator Greenleaf’s Senate Bill 554 to protect the child victims of human trafficking from criminal prosecution. The legislation, known as Safe Harbor, passed the Senate unanimously in April of 2017. Sen. Camera Bartolotta (R-Washington) on Tuesday called on Congress to support the development of an ethane storage hub in the Appalachian region. Senate Bill 880 allows trailers up to 102 inches wide on Pennsylvania highways. The Senate Appropriations Committee, chaired by Sen. Pat Browne (R-Lehigh), approved eight bills on June 4. The Senate Consumer Protection and Professional Licensure Committee, chaired by Sen. Tommy Tomlinson (R-Bucks), approved three bills on Wednesday. The Senate Finance Committee, chaired by Sen. Scott Hutchinson (R-Venango), approved House Bill 1460 on Wednesday. The bill imposes additional reporting requirements on the Public School Employees’ Retirement System and the State Employees’ Retirement System. The Senate Judiciary Committee, chaired by Sen. Stewart Greenleaf (R-Montgomery), approved 11 bills on Tuesday. The Senate Labor and Industry Committee, chaired by Sen. Kim Ward (R-Westmoreland), approved two bills on Tuesday. You can view the reports here and discussion of the reports here. 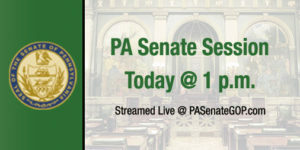 On Tuesday, the Senate Majority Policy Committee, chaired by Sen. David Argall (R-Schuylkill), held a public hearing on work requirements for welfare recipients. One of the architects of Maine’s expansion of work requirements for welfare discussed efforts to replicate the success in Pennsylvania. The Senate Veterans Affairs and Emergency Preparedness Committee, chaired by Sen. Randy Vulakovich (R-Allegheny), approved two bills on Tuesday.